Can electricians perform appliance repair? Absolutely. A number of skills are easily transferable from one field to the other, helping you build a portfolio of work on both electrical and repair appliances. These similarities make for a natural fit, but some nuance is required. Make no mistake: electrician and appliance repair professionals are not the same things. While one individual can possess both qualifications, they have different nuances that require further examination. That said, the various overlaps between the two fields make expanding your portfolio from electrician to appliance repair professional a realistic opportunity. The electrical expertise. Above all, appliance repair is largely and often electrical. 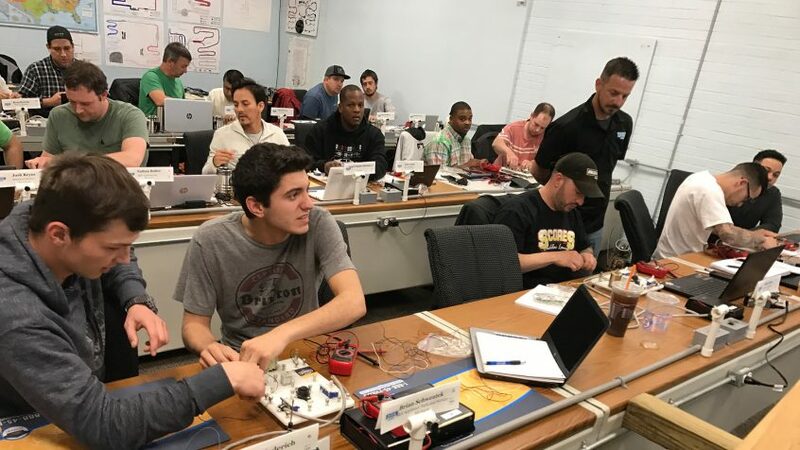 All of our courses include an emphasis on electrical theory, teaching students anything from understanding how electricity moves through a home all the way to learning about switches and checking for power. Appliances are largely and always connected to electricity, necessitating the type of expertise that professional electricians can bring to the table. Project-based work. Like electricians, appliance repair professionals will work on similar types of projects. Long-term contracts exist and can be planned ahead, but short-term emergencies will make up a significant part of the equation. A customer with an electrical problem will call just as urgently as one whose washing machine or refrigerator no longer works. As a result, the pace of work in both positions tends to be very similar. The importance of customer relations. Finally, don’t underestimate the importance of soft customer relations skills in each profession. Both trades are largely reputation-based; a large portion of your customers will come through repeat business, personal recommendations, and word of mouth. As a result, treating your customers well, and being responsive to both questions and concerns, is absolutely vital to success for both electricians and appliance repair professionals. While the similarities between the two professions are undeniable, it’s important to consider the nuances that make them different as well. An electrician can not automatically begin to install appliances, for a wide range of reasons. To start, appliance repair requires in-depth knowledge of specific appliances and brands, such as Bosch dishwashers or GE refrigerators. Electricians, on the other hand, tend to deal with relatively generic customer problems that don’t change much based on these variables. That, in turn, requires specific expertise about the field you look to enter. An electrician might not know exactly how to check the baking elements of a gas range. On the other hand, an appliance professional probably won’t be able to install a new electrical box based on his appliance training alone. In short, appliance repair is a natural next step for electrical professionals looking to expand their portfolio. The various similarities mentioned above make for an ideal overlap, helping you build on your existing qualifications without having to engage in an entirely new education from scratch. Of course, you still have to find a way to get the additional training you need to overcome the differences between the two fields. For help in that regard, contact us. We pride ourselves in our hands-on education that can prepare electricians and a number of other professionals for a long and successful career in repairing a wide range of household appliances.